According to a Social Media Examiner report, Facebook is the most important social platform for marketers. With a jaw-dropping 2.2billion active monthly users, 26% of whom made a purchase by clicking on an ad on the platform, Facebook is a digital marketing paradise. Sadly, not everyone gets FB ads right. To help you win more business on the platform, we’ve handpicked 5 examples of Facebook ads that did well. Whether you’ve got a huge or small budget to play with I’m sure you’ll find solid nuggets to try from the case studies. Before we jump into the details let’s note a few foul-ups to avoid as unveiled by Jacob McMillen. Paid advertising revolves around specificity. The first and most important step to any successful ad campaign is a clearly defined goal. If you don’t know what you want, you won’t get any results. Many brands slip-up by targeting a general audience. The more narrowly you can define your audience, the more effective you will be at reaching them. The ideal sales pitch is a 1-to-1 conversation. One of the biggest mistakes Facebook advertisers make is creating a few ads and dumping them. Successful Facebook advertising is a process. You start with a couple of ads, run them for a week or so, and then select the top 2-3 performers. Another big mistake startups make is failing to test every aspect of their ads. As with everything online test don’t assume. If you aren’t actively marketing to your fans, you’re making a huge mistake. When you target existing page fans with your Facebook ads, your click-throughs rise exponentially, up to 700%! Because you are promoting to people already interested in your brand. This may sound obvious, but a lot of businesses run ad campaigns without first setting up an optimized landing page. They send their hard-won warm traffic to their homepage or Facebook fan page. This kills conversions. Instead, you should direct your traffic to a special page specifically designed for that campaign. The average conversion rate for FB across industries is 9%. So what happens to the other 91% of non-buyers who were interested enough to click-through to your site, but just weren’t ready to convert? Clueless brands let them go just like that. Wise companies remarket to them. 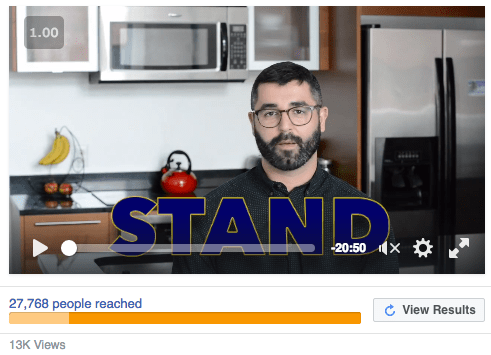 Now that we’ve sidestepped the common mistakes, let’s move on to great Facebook ads examples and see what we can learn from them. Facebook advertising expert Andrew Hubbard netted $36,449 for one of his clients’ flagship course launch using FB ads. Take a look at one of the ads he used in the campaign. The hero image is bright and attractive. It focuses on the core offer. Crucially, it uses a pic of a smiling face which has been known to boost conversions. Also, it opens with a nagging question most people have about hosting a Virtual Summit. Note also how Navid, the course creator is looking at the offer. This acts as a visual cue for people to look at the lead magnet since people are wired to follow other people’s gazes. See the perfect coupling of the ad and landing page copy? 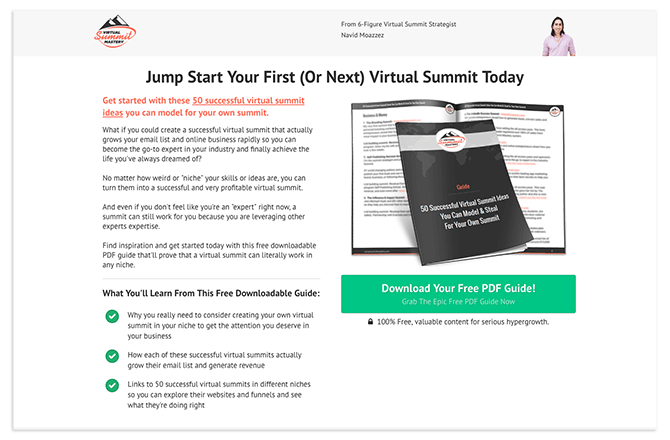 The first line on the ad asks a question about Virtual Summits, the first line of the landing page answers it. This preserves the copy scent thus increasing the likelihood of conversions. Through constant testing and tweaking, the campaign reduced the cost per lead from $10.42 to $3.76 within a week. Here are the results they got from $4,159 ad budget. $36,449 in revenue, a876% ROI! Testing is key– Don’t just publish your ads and hope for the best. Test, tweak and redeploy. Rinse and repeat until you find the winners. Copy scent– Ensure that there’s no disharmony between the ad copy and the landing page copy. Make sure the ad and landing page copy are similar to the buyer journey becomes smooth. Human faces– Use human psychology to your advantage. Use faces of people in your ad and landing pages to boost conversions. A quality engaged email list is the lifeblood of online business. But, for most startups, getting new subscribers from their blog is an arduous uphill task. Mary Fernandez used FB to overcome this challenge. She netted a whopping 532 subscribers in just 43 days. Amazingly, she did this as a total newbie in Facebook advertising. Here’s one of her ads. The 3 numbered elements show why this ad worked so well. First, her sumptuous lead magnet. Second, her hero image shows a pregnant woman working out. Not just exercising but enjoying the workout. That’s crucial because people associate workouts with pain. By showing the lady delighting in the exercise, she whets her audience’s desire for her incentive. Finally, her copy is personal and intimate. 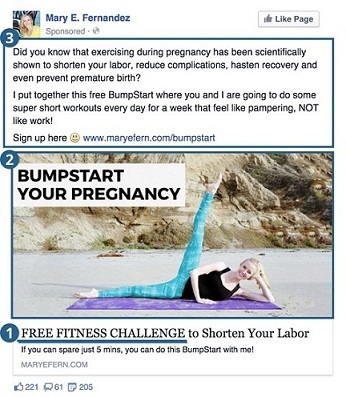 Her headline ‘Bumpstart Your Pregnancy’ is witty and grabbing. She uses a casual conversational tone throughout to instantly connect with her audience. Below are the results of Mary’s campaign. As you can see, Mary got 532 subscribers at only $0,43 per lead/conversion. Pertinent incentive– Use a relevant lead magnet that addresses a nagging problem your audience has. If you scratch your target audience’s itch, they’ll reward you with signups. Quick wins– People gravitate towards products and services that help them get to their goals fast. Your incentive should offer a quick win so people are magnetized by it. Incisive copy– Write your copy in a simple everyday conversational style that people can relate to. People easily identify with a simple, direct, and sharp style. Want to know more about how to acquire new customers? 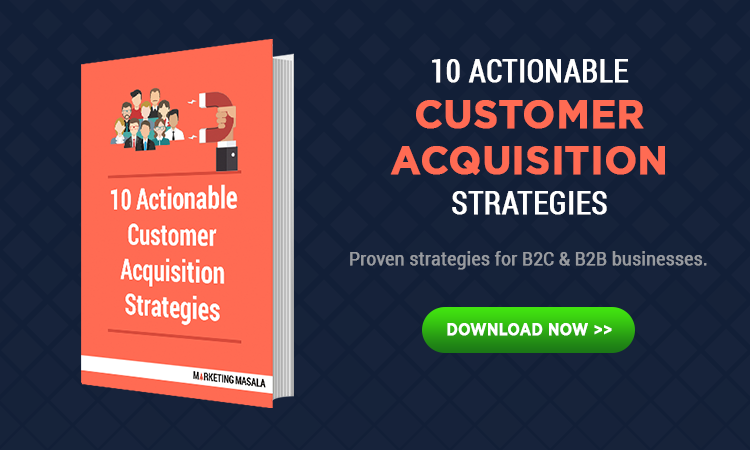 We’ve compiled 10 B2B and B2C customer acquisition strategies in a free book. Get your copy today! Cart abandonment is a harsh reality of online marketing. But it can be easily countered by smart retargeting. By reselling to people who did not go through with their initial purchase, you can significantly improve your revenue. 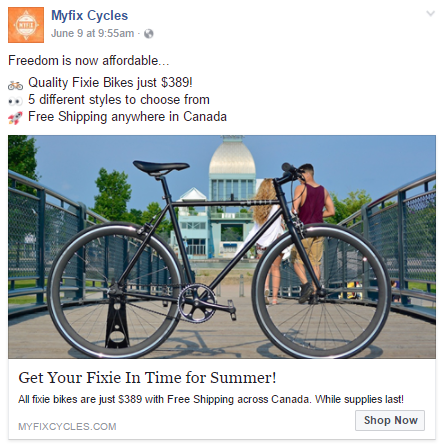 Myfix Cycles boosted their income through clever Facebook advertising. Below is a shot of their ad. Three things stand out here. First is their use of emojis. Ad Espresso revealed that emojis boost clickthrough rates. The ad achieved a 6.38% CTR, reducing their cost per click significantly. Second, the ad is dominated by a picture of a bike. On social media, people are not so concerned about specs and all. They just want to see what’s on offer. Images account for 75-90% of Facebook Ad performance. Finally, the ad emphasizes free shipping. Twice, on top and at the bottom of the ad the prospect is reminded that shipping is free. This incentivizes prospects to buy the bike without worrying about transport costs. That’s a hefty payoff 1,529% on ad spend. Or, to put it, in other words, about $15 for every $1 spent. Product images– The size of your conversions is linked to the quality of your product images. The higher the quality of your images the higher your conversions and vice-versa. Free shipping– Leverage the irresistible power of free shipping to nudge tightfisted buyers over the purchasing line. Get out of the box– Don’t be scared to do the unusual. For instance, try using emojis in your ads and see if they don’t hike conversions. Facebook ads are great for anyone on a shoestring budget. Whether you want to test interest for a new product or make an affiliate offer, you can do so without spending much. 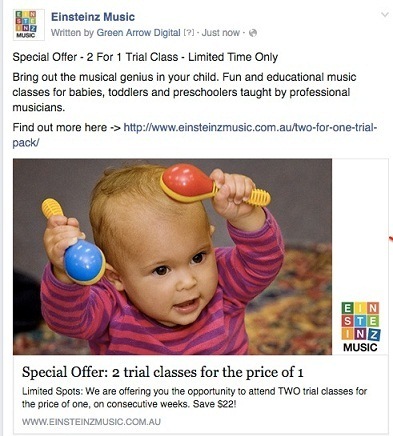 Green Arrow Digital successfully boosted the numbers of a trial class for their client on a modest budget of $240. Since the business teaches music lessons to bambinos, the baby pic was a perfect fit for the target audience — toddler moms. The ad title is short (10 words) but packs a lot of important information. It focuses on the benefits and adds a bit of urgency ‘limited time only’. The copy at the bottom piles on the benefits by reinforcing the fact that it’s two classes for the price of one. And, by taking up the offer you save $22. So what were the results of the 5-day campaign? 16 actually booked in a paid for their class. 5 ended up enrolling for the entire term. Total ROI of $1,023 from an ad investment of $240. Images– Use images that resonate with your target audience. To do that you’ve got to know them intimately. Start small– Don’t wait until you have a big budget to launch a campaign. Start with whatever you have no matter how small. Armed with the results of your mini-campaign you can then invest more if the ads show potential. Ad title– Keep your ad title short, sharp and sweet. Aim for less than ten words. Anything more and you risk a serious reduction in your conversion figures. Studies show that the ideal length for a Facebook ad title is 5 words to 15 words for a link description. It’s common knowledge in marketing circles that it takes 5-8 touchpoints to move someone from prospect to buyer. To do that you need a solid funnel. 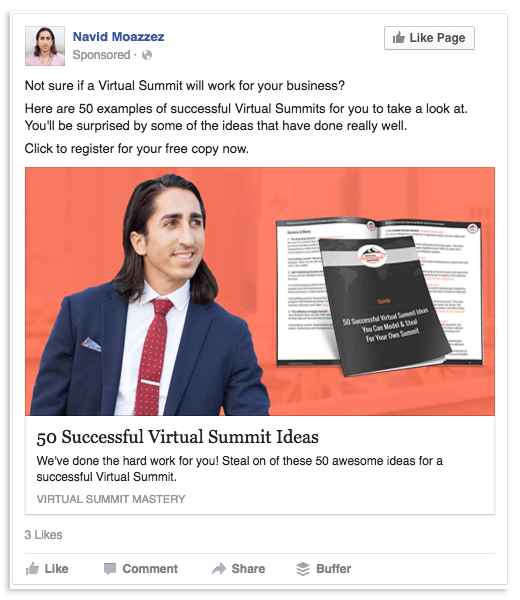 This case study is all about using FB ads to build a good funnel. Unlike most people who link their ads to a landing page and gun for the sale straightaway, Ryan Steward of Webris did things differently. His strategy revolved around awesome content. He used his ads to drive traffic to a value-packed webinar. When someone watched the webinar, they were led deeper into the funnel through a series of videos culminating with the sale on the 6th video. See one shot of the videos below. Ryan’s secret to success was focusing on people who demonstrated intent. He used Facebook to segment his list with URL and duration combinations as shown below. He zeroed in on people who had watched his videos for at least 10 seconds. This way he built a custom and highly engaged audience that absolutely loved his content. He served up the video content on Facebook, not on his site. By the time he took them off the network, he had provided so much value that they couldn’t wait to buy from him. Custom audiences– Use Facebook powers to build a custom audience. Such highly targeted groups are super-engaged and convert way better than generic audiences. Target intent- To get off the charts conversions target people who show intent. Decide beforehand the type of action you want your prospects to take for you to continue marketing to them. Build your funnel– Without a solid funnel, you risk burning your precious advertising dollars. Don’t just take your traffic to a landing page, direct them to your funnel so you can remarket to them even if they don’t convert initially. Delay the sale– Since it takes a while to move a prospect from awareness to the purchase point, don’t rush the sale. Craft a value-packed buyer journey that’ll make prospects 10x more likely to buy from you. I hope you found inspiration from these case studies. Target with precision. Test relentlessly. Try uncommon ideas. If you keep at it, you may come up with a moneymaker and become the next Facebook advertising success story.